In today’s world it’s essential that you have systems and solutions in place to support your delivery of quality services to learners of all needs. 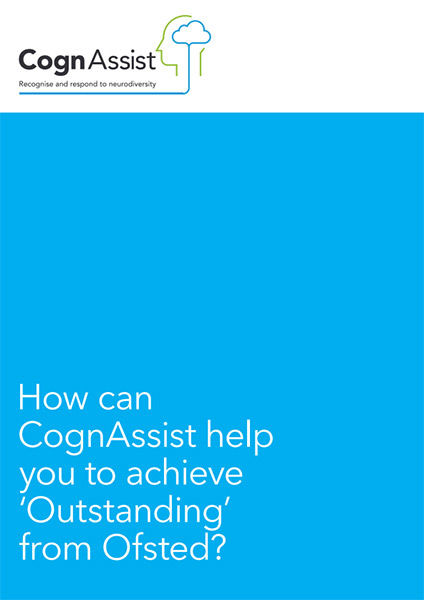 “CognAssist can help you to identify how these learners and apprentices learn best and what strategies you can then use to maximise their learning and the development of crucial employability and personal skills.” Richard Moore, who previously served as a Her Majesties Inspector for Ofsted. CognAssist provides online training resources to train your staff in neurodiversity. We’ll help them discover how to identify, recognise and address the learning needs of individuals. Our assessment, engagement reports and staff training supports you in drawing down up to £150 per apprentice per month. Our Assessment Report identifies and records an individual’s specific needs and can be used to support the learner being identified as being supported with LSF1 funding. These reports can be downloaded and added to the learners e-portfolio. Monthly engagement reports are produced for each identified learner, and detail the adaptive strategies they’ve been taught over the month. These reports include guidance for the Training Assessor (TA) on how to incorporate the strategies into the sessions, and the TA can include this information on their notes to further support evidence for funding audits. These reports can also be uploaded to the learners e-portfolio suite. Training materials inform and empower the TA to understand the neurodiversity of each of their learners. They show the TA how to adapt their teaching, which in turn enhances their ability to report the work for evidence during an audit. We also help you improve the way you manage TAs within your business, by providing you with their detailed performance information. That means you’ll know exactly how well the apprentices are engaging with their individual solutions.